What made you decide to write your first novel? What drew you to writing in the crime/suspense genre? I think you mean “first published novel,” because like a lot of writers I have a number of earlier efforts that are providing ballast for my desk drawer. And I say that without shame—you have to start somewhere! But as for Wrong Place, Wrong Time, I was inspired by a movie: 1950’s The Flame and the Arrow, in which Burt Lancaster kidnaps Virginia Mayo in order to exchange her for his son, whom her uncle is holding. It is a merry romp, much in the style of 1938’s Robin Hood—so much so, in fact, that they reused many of the props and costumes from the earlier film to save money. I started to wonder how the story would have been different if it had happened in real life, because in real life, multiple abductions are a felony, not a romp. Thus was my first (published) novel born. While I was struggling to get the story from my head to the page, my husband suggested I read Robert B. Parker, in particular his famous Spenser series. (This was probably right around the time I was moaning, “How do I write a fight scene? I’ve never written a fight scene!”) Parker quickly became my mentor, even though I never met him. From him I learned huge amounts about snappy dialogue, pacing, emotive description, and, yes, fight scenes. Encouragement? Yes. I got bags of help. I took classes at Grub Street, Boston’s writing center, and workshopped the manuscript there. I had my ruthless husband read it aloud to me so I could hear the awkward bits—and I still missed some. I hired a professional editor. Feedback is invaluable. Some of it should come from loved ones, but more should come from people who don’t love you and care not a whit about your self-esteem. Ultimately I was happy with my final draft. 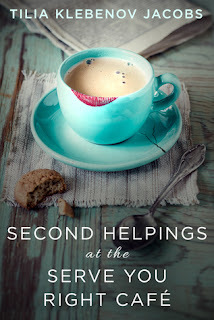 In fact, the system worked so well that I used the same approach for my next book, Second Helpings at the Serve You Right Café: get it as good as I can on my own; have super-husband read it to me aloud; make it better; and hand it over to my brilliant and merciless editor. Believe it or not, the title. Both of my books went through at least half a dozen of them. At one point, Wrong Place, Wrong Time was The Thief of Lightning. There is no lightning and no thief in it, but I liked the title. So did Rick Riordan, who thought of something remarkably similar before I did. I finally got Wrong Place, Wrong Time from something one of the characters says. For a while, Second Helpings was Yester dreams and Tomorrow songs or something similar, which, though poetic, would surely have made the reading public go cross-eyed trying to figure it out. Linden Tree Press is your imprint, correct? What made you decide to go the indie route? Did you try the traditional route first? I sure did try the traditional route, and it led me directly to indie-pubbing. 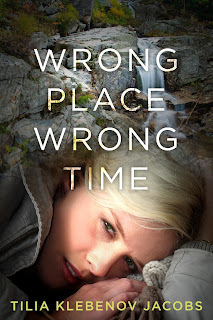 Over thirty agents and publishers rejected Wrong Place, Wrong Time. I found this process both discouraging and time-consuming: every hour that I spent researching and querying agents and publishers was an hour when I wasn’t writing fiction. Or nonfiction. At first, I resisted the indie route. Even now, some people assume it is the last refuge of the unpublishable writer. Then I discovered Gertrude Stein, Mark Twain, Virginia Woolf, Beatrix Potter, and James Joyce all indie-pubbed, and that’s not a bad club to be in. In fact, Virginia Woolf and her husband, Leonard Woolf, founded Hogarth Press to publish her books. The company still exists as an imprint of The Crown Publishing Group, part of Random House. My second big discovery was that if you go indie, you get to steer the ship. What gets published is your work, your vision. No one edits typos into it or slaps a cheap cover onto your magnum opus. Add to all this the fact that the royalties are vastly higher for independent writers, and you have a pretty compelling argument that there is more than one way to get published. 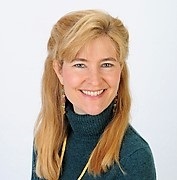 My first book’s unblemished record of rejections made me doubt myself as a writer, which was frightening. I decided the best way to get over that would be to write something, stat! The result was Second Helpings, the story of an ex-con out on parole who discovers he is being framed for a crime he didn’t commit. Like its older sibling, this book too was rejected everywhere I submitted it. Both of my unpublishable books fared very well when I released them myself. Wrong Place, Wrong Time was an Amazon bestseller, peaking at #46 in the Kindle Store and winning the Beverly Hills Book Award for Best Thriller; Second Helpings at the Serve You Right Café won Honorable Mention in the London Book Festival and was ranked in the top 10% of Kindle reviews. Remember: almost every book you’ve ever loved started out as a pile of rejection slips. What surprised me then and frustrates me now is how little of the business has to do with quality. Some days it seems that no one cares that you’ve written a good book (or, perhaps, a bad one). It truly doesn’t matter. Agents, publishers, and booksellers are often unwilling to take a risk on anything that is too different from what they’ve seen before, or too similar. Bookstores in particular have been very difficult to deal with, as they seldom want to give up valuable shelf space to an unknown author when their bread and butter comes from Stephen King and Clive Cussler. I had one bookstore owner tell me he would carry my book if I gave him $100. I haven’t set foot in his establishment since. It takes just as long to write something bad as something good, so you might as well write something good. I once wrote a schlocky romance novel, thinking that I could churn out some genre fiction that would be saleable. The result? I spent a long time on a piece of pulp so profoundly mediocre it isn’t even bad enough to be good. Oh, and no one wanted to buy it. So a corollary to the first rule is, since you’re unlikely to get published anyway, write what you want, not what you think the market wants. To paraphrase Chris Baty, the founder of National Novel Writing Month, you can rewrite a really terrible first draft into something great, but you can’t rewrite a blank page into anything. He’s right. I don’t believe in writer’s block. You haven’t run out of words. Just get something down on paper. So what if it stinks? You can fix it later. Just write. A writer needs drafts on paper the way a potter needs clay. Create your raw material now; glaze and fire it later. Your next book coming out is an MG fantasy. Can you give me a short synopsis? This is a tale of wondrous magic and great suffering. You will meet a foul villain and the heroes who battled him. Trolls are involved, and twins. Oh, and a beautiful princess, but not in the way that you might imagine. Casper and Jasper are fast-talking, twelve-year-old twins who discover that their parents, long believed dead, are in fact rebels being held by the despotic Count Wilhelm Scream. When the boys set out to rescue their parents, they stumble into a land of werewolves, trolls, and carnivorous marshmallows. Will the twins’ loyalty and quick wits be enough? I suppose that’s more of a teaser than a synopsis, but I hope it’s enough to whet everyone’s appetite! The working title is Casper and Jasper and the Terrible Tyrant. How do you switch genre gears so dramatically? Switching gears between genres was easy in some ways and difficult in others. I think the biggest challenge for me was tone. After years of honing my skills writing snappy, if sometimes cynical, adult banter, I now had to be sure my protagonists sounded innocent but witty, and optimistic even when facing down evil villains such as Princess Abattoir and her secret police. I also had to be sure the landscape was whimsical, not depressing. And so-forth. What made the switch so appealing is that I love middle grade fantasy. I cut my teeth on Edward Eager and Susan Cooper; these days I joyfully read Terry Pratchett and J.K. Rowling. Great writing is great writing, no matter the genre or target demographic. And as a writer, the task is largely the same: your protagonists still have to be appealing; the dialogue has to reveal character and advance plot; the setting has to establish mood; and so-forth. Furthermore, there’s a certain Venn diagram overlap between the two styles if you think about it, as both are ultimately about the triumph of good over evil. Crime fiction describes a temporary breach of the status quo (a crime is committed), followed by a period of chaos (during which the crime affects everyone), and concluding in the reestablishment of law and order (the crime is solved and the perpetrator is held accountable, usually within the confines of the justice system). In this way it is not unlike fantasy, in which the heroes leave their everyday world to battle cosmic forces of oppression, against which they ultimately win; and they return from this encounter bearing boons that benefit their homelands, usually by establishing the very peace and order which the villain had usurped. Good points, Tilia. Thanks for sharing your writing journey. If you would like to know more about Tilia’s writing here are some options.